The Garmin Forerunner 935 010-01746-00. This premium GPS running/Triathlon Watch helps you fine-tune your training and recovery to be a better athlete. For the competitor in you, it features Strava live segments so you can turn every run or ride into a virtual competition. For the "looks count, too" in you, interchangeable bands let you quickly change bands for a new Sport or style. The Running Dynamics Pod has an accelerometer in the module that measures torso movement to calculate these 6 running metrics: - Cadence is the number of steps per minute. It displays the total steps (right and left combined). - Ground contact time balance displays the left/right balance of your ground contact time while running. It displays a percentage. For example, 53.2 with an arrow pointing left or right. - Stride length is the length of your stride from 1 footfall to the next. It is measured in meters. - Vertical oscillation is your bounce while running. It displays the vertical motion of your torso, measured in centimeters for each step. - Vertical ratio is the ratio of vertical oscillation to stride length. It displays a percentage. A lower number typically indicates better running form. 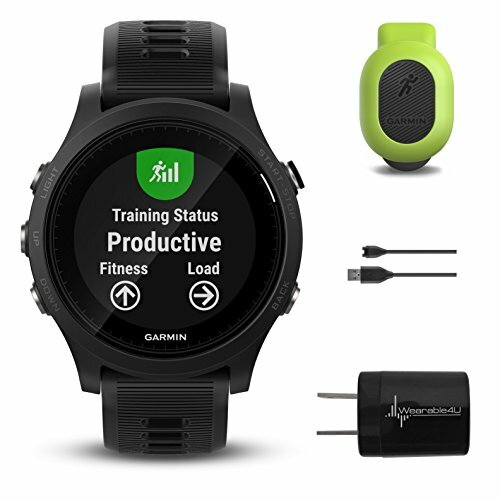 GARMIN RUNNING DYNAMICS POD ($69.99): The Running Dynamics Pod easily clips onto your waistband to measure the running dynamics you need to beat yesterday. It gives you the option to run without a heart rate monitor chest strap. Once paired with your compatible smartwatch, just clip it to the back and center of your waistband and start your run. WALL CHARGING ADAPTER ($2): It gives you the option to charge your FORERUNNER 935 from any wall outlet, not from USB only. View More In Running GPS Units. If you have any questions about this product by Wearable4U, contact us by completing and submitting the form below. If you are looking for a specif part number, please include it with your message. © 2019 - isharemaps.com. All Rights Reserved.